This article discusses radiographic positioning for the Radiologic Technologist (X-Ray Tech) to show the shoulder and humerus. Purpose and Structures Shown: This view should demonstrate the bones and soft tissue of the upper arm, specifically the full length of the humerus, elbow and shoulder joints, and epicondyles without rotation. Position of patient: The patient should be seated upright or in a standing position with the back of their shoulder resting on the bucky. The patient should suspend respiration for the exposure. Position of part: Slightly abduct the arm and supinate the hand. The coronal plane of the epicondyles and the the image receptor plane should be parallel. Central ray: Perpendicular to the image receptor and directed at the middle portion of the humerus and center of the image receptor. Position of part: Internally rotate the arm and then flex elbow to about 90 degrees. Place the hand’s palm over the hip unless contraindicated due to pain (e.g. fracture) otherwise across the abdomen palm up. The coronal plane of the epicondyles and the image receptor plane should be perpendicular. Central ray: Perpendicularto the image receptor at the middle portion of the humerus and center of the image receptor. Purpose and Structures Shown: This view should demonstrate the bones and soft tissue of the humerus and shoulder including the proximal humerus superimposed with structures of the thorax. Position of patient: The position of the patient should be either upright or supine. The upright position may be more comfortable than the table for some patients. The upright position also allows for more precise shoulder adjustment. The patient should suspend respiration on full inspiration for the exposure. Position of part: Move the opposite arm toward the head and rest the forearm on the head elevating the shoulder as much as the patient can. Elevation of the uninjured shoulder depresses the shoulder of the injured side preventing superimposition. the patient’s midcoronal plane should be in a 90 degree relationship with the image receptor. Don’t move the injured arm, it should be down in a normal relaxed position. Center the image receptor to the level of the surgical neck of the injured humerus. Central ray: The central ray should be perpendicular to the image receptor passing through the patient’s midcoronal plane at the area of the surgical neck of the injured humerus. If the uninjured shoulder can’t be elevated, the central ray should be angulated 10-15 degrees cephalad. Purpose and Structures Shown: This view should demonstrate the bones and soft tissue of the shoulder, glenoid fossa, proximal end of humerus, acromioclavicular joint, outer surface of coracoid process, insertion of the subscapularis muscle at the body of scapula, and insertion of the teres minor muscle at inferior axillary border. Position of patient: The patient should be seated sideways at the end of the the table low enough to permit extension of the shoulder. Leaning laterally towards the the table to center the shoulder joint on the image receptor. The patient should suspend respiration for the exposure. Position of part: Rest the elbow on the table. Flex the elbow approximately 90 degrees and place the hand in a prone position on the table. Tilt the patient’s head away from the injured shoulder. Place the humeral epicondyles alligned vertically. Central ray: The central ray should be 5-15 degrees laterally traversing the shoulder joint and toward the area of the elbow. Purpose and Structures Shown: This view should demonstrate the bones and soft tissue of the shoulder including the proximal humerus, scapulohumeral joint lateral portion of the coracoid process, acromioclavicular joint, and lesser tubercle of the humerus and greater tubercle of the humerus. Using the Rafert modification, the posterolateral humeral head is shown. Position of patient: There are four variations of this exam. The Lawrence method, the Rafert method, the Clements method, and the West Point method. They all yield similar results to each other as well as similar results to the Shoulder Superoinferior Axial view below. The five methods (including Shoulder Superoinferior Axial) vary primarily in the way that the patient is positioned. This grants the technologist options to acquire images with patients in various states of trauma. One exception is the Rafert method which allows for better visualization of Hill-Sachs lesions, which are a posterolateral humeral head compression fracture. For all variations, support the image receptor in contact with the superior part of the shoulder and as near as possible to the neck. The patient’s head should be turned away from the side being examined. For the Lawrence and Rafert Methods, the patient is in a supine position, slightly elevate head and shoulders. For the West Point Method, the patient is in a prone position. For the Clements modification, the patient should be in a lateral recumbent position resting on the uninjured area.The patient should suspend respiration for the exposure. Position of part: Abduct the arm of the affected area at 90 degrees to the body’s long axis. The humerus should be externally rotated with support under the forearm and hand. Avoid overstressing of the shoulder joint area. For the Rafert Modification, the arm is rotated until the hand forms a 45-degree oblique and thumb is positioned downward. There is no rotation of arm for the West Point Method. Central ray: For the Lawrence and Rafert Methods, on the medial plane, the central ray should be angled between 15 and 30 degrees medially depending on the degree of abduction of the arm and passing through the acromioclavicular joint. For the West Point method, a dual angle of 25 degrees anterior from horizontal and 25 degrees medial. For the Clements modification, the central ray should be perpendicular to the image receptor and Horizontal along the patient’s midcoronal plane through the shoulder’s midaxillary region, or angled 5-15 degrees medially when the patient can’t abduct the arm the full 90 degrees. Purpose and Structures Shown: This view should demonstrate the bones and soft tissue of the shoulder. The AP Axial (cephalic angle rather than perpendicular) is often used because it prevents superimposition of the clavicle. It shows the relationship of the head of the humerus to the glenoid fossa for diagnosing cases of posterior dislocation. Position of patient: The patient can be in either an upright or supine position. The patient should suspend respiration for the exposure. Position of part: Center the scapulohumeral joint to the midline of the grid. 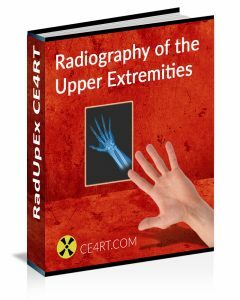 Often, internal and external rotation views are requested requiring the patient to rotate their hand internally for one view, and externally for a second view. Central ray: The central ray should be directed to the scapulohumeral joint perpendicular to the image receptor. For an AP Axial, a cephalic angle of 35 degrees. Purpose and Structures Shown: This view should demonstrate the bones and soft tissue of the shoulder specifically the scapular Y. It is often used for examination of suspected shoulder dislocations. Position of patient: The position of the patient can be either recumbent or upright. A posterior oblique position is often better when the patient is injured. The patient should suspend respiration for the exposure. Position of part: With the anterior surface of the affected shoulder facing the the image receptor, turn the patient to place the midcoronal plane at an angle of 45-60 degrees anterior oblique with their arms down. The flat surface of the scapula is positioned perpendicular to the image receptor. Central ray: Perpendicular to the image receptor directed to the scapulohumeral articulation. Purpose and Structures Shown: This view should demonstrate the bones and soft tissue of the shoulder, specifically the joint space between humeral head and glenoid cavity. Position of patient: The position of the patient can be either recumbent or upright. Position of part: Elevate the shoulder and hip or turn the body for about 35 to more than 45 degrees towards the injured side. The degree of rotation is adjusted by placing the scapula parallel to the plane of the the image receptor. The patient should suspend respiration for the exposure. The head of the humerus should be in contact with the the image receptor. Abduct the arm slightly in internal rotation and rest the palm on the abdomen. Central ray: The central ray should be perpendicular to the image receptor directed to the glenoid fossa or 2 inches medial and 2 inches inferior to the superolateral border of the shoulder. Purpose and Structures Shown: This view should demonstrate the bones and soft tissue of the shoulder. Specifically the posterior surface of the acromion and acromioclavicular joint. Position of patient: The position of the patient can be either recumbent or upright. Patient’s arm to their side. Position of part: Place the injured shoulder in contact with the the image receptor. Rotate the unaffected side away from the the image receptor 45-60 degrees until the flat aspect of the scapula is perpendicular to the the image receptor. The patient should suspend respiration for the exposure. Central ray: The central ray should be 10-15 degrees caudal passing through the superior portion of the humeral head. Purpose and Structures Shown: This view should demonstrate the bones and soft tissue of the shoulder and the posterosuperior and posterolateral areas of the humeral head. It is sometimes useful in identifying the cause of shoulder dislocation including dislocations caused by posterior defects. Position of patient: The patient should be in a supine position. The patient should suspend respiration for the exposure. Position of part: The affected arm is flexed for more than 90 degrees and the hand is place on the top of the head. Make the body of the humerus parallel to the midsagittal plane. Central ray: The central ray should be 10 degree cephalad angulation passing through the coracoid process. Purpose and Structures Shown: This view should demonstrate if there is a loss of articular cartilage in the scapulohumeral articulation. Position of patient: The position of the patient can be either recumbent or upright. Patient’s arm to their side with the back of the shoulder resting on the bucky. Position of part: Turn the body for about 35-45 degrees towards the affected side. The patient should hold a 1 pound weight using the hand of the affected side in neutral position. The patient should suspend respiration for the exposure. Central ray: The central ray should be perpendicular to the image receptor directed to the the image receptor at the level of the coracoid process. Purpose and Structures Shown: This view should demonstrate the bones and soft tissue of the shoulder specifically the Glenoid cavity, scapulohumeral joint, humeral head, coracoid process, scapular head and neck. Position of patient: The position of the patient can be either recumbent or upright. Turn the body about 45 degrees towards the injured side with the back of the shoulder resting on the bucky. Abduct the arm slightly in internal rotation and rest the palm on the abdomen. Position of part: The posterior surface of the injured side should be closest to the the image receptor. Central ray: The central ray should be 45 degree caudad passing through the scapulohumeral articulation. Purpose and Structures Shown: This view should demonstrate the bones and soft tissue of the shoulder, specifically the intertubercular groove free of superimposition of the shoulder. Position of patient: Support the the image receptor in a vertical position in contact with the superior part of the shoulder and as near as possible to the neck and turn the patient’s head away from the side being examined. The patient should suspend respiration for the exposure. For the Fisk modification, the patient stands at edge of the table leaning over the image receptor similar to a tangential clavicle view (below) but with a perpendicular CR. Position of part: The anterior surface of the shoulder is palpated to localize the intertubercular groove. Supinate the hand. For the Fisk modification, flex the elbow with the posterior forearm on the the table and adjust the anterior or posterior leaning of the patient to place the humerus at an angle of 10-15 degrees. Central ray: The central ray should be 10-15 degrees posterior at the intertubercular groove. For the Fisk modification, the central ray should be perpendicular to the image receptor at the intertubercular groove and the vertically positioned humerus is angulated at 10-15 degrees. Purpose and Structures Shown: This view should demonstrate bones and soft tissue of the shoulder specifically the insertion of the teres minor which is projected by rotating the head of the humerus. It also shows the greater tubercle superimposed by the humeral head, lesser tubercle pointing medially, and the soft tissue around the humerus with trabecular detail on the head of the humerus. Position of patient: The patient should be prone with arms at the sides of the body and head resting on the cheek of the injured side. The patient should suspend respiration for the exposure. Position of part: Internally rotate the arm and if possible, flex the arm and place hand on the back of the patient. Central ray: The central ray should be perpendicular to the image receptor at the head of the humerus. Purpose and Structures Shown: This view should demonstrate bones and soft tissue of the shoulder, specifically the insertion of the subscapularis at the lesser tubercle. Position of patient: The patient should be supine with arms resting on the side of the body. The patient should suspend respiration for the exposure. Position of part: Move the arm of the injured side away from the body and then flex the elbow. Rotate the arm internally pronating the hand. The opposite shoulder may be elevated for about 15 degrees. Central ray: The central ray should be perpendicular to the image receptor at the shoulder joint passing through the coracoid process. Purpose and Structures Shown: This view should demonstrate bones and soft tissue of the shoulder, specifically to demonstrate separation, dislocation, and function of the shoulder joints by showing bilateral images of the acromioclavicular joints simultaneously. Position of patient: The position of the patient can be either seated or standing upright with the back of the patient’s shoulders resting on the image receptor. The midline of the patient’s body should be centered at the midline of the grid. 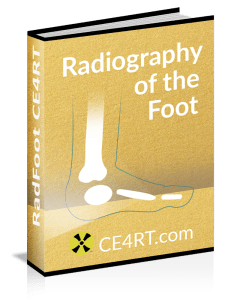 The weight of the patient’s body should be equally distributed on both feet to avoid rotation. The patient should suspend respiration for the exposure. Position of part: While the patient’s arms are hanging on the sides, the shoulders should be positioned on the same horizontal plane. First exposure: patient is standing upright with no weights. Second exposure: Patient standing upright with equal weights (5-8 pounds) on attached with straps on both wrists. Do not make the patient hold the weights using hand because this contracts the shoulder muscle reducing the small acromioclavicular separation. A thyroid collar is usually recommended since the thyroid gland is exposed to the primary beam. Central ray: SID is usually 72 inches or greater. The central ray should be perpendicular to the image receptor at the midline of the body at the level of the acromioclavicular joint for a single projection. Purpose and Structures Shown: This view should demonstrate bones and soft tissue of the shoulder, specifically the acromioclavicular joint. Examination of suspected Acromioclavicular subluxation or dislocation. Position of patient: The position of the patient can be either seated or standing upright with the back of the patient’s shoulders resting on the image receptor. The patient should suspend respiration for the exposure. Alternatively, the patient can be supine or lordotic. Position of part: Center the AC joint to the midline of the grid. Patient’s arms down comfortably. Central ray: Cephalic angle of 10 – 15 degrees or even up to 30 degrees cephalic, and directed at the coracoid process. This projects the acromioclavicular articulation superior to the acromion. A reduction in technique is sometimes recommended to avoid over penetration of the AC joint. Purpose and Structures Shown: This view should demonstrate bones and soft tissue of the shoulder, specifically the acromioclavicular joint. Examination of suspected Acromioclavicular subluxation or dislocation. It is an alternative to the Zanca view above and brings the AC joint closer to the image receptor for a slightly clearer image, however it is slightly more difficult to execute well. Position of patient: The position of the patient can be either seated or standing upright facing the the image receptor with the hand of the injured side under the other axilla. Turn the patient to make the midcoronal plane at an angle of 45-60 degrees to place the scapula at a right angle to the the image receptor. The patient should suspend respiration for the exposure. Position of part: Center the acromioclavicular articulation to the midline of the grid. Lean the shoulder of the affected side toward the the image receptor stand and have ptient pull arm firmly across the chest. Pulling of the arm draws the scapula laterally and forward and places the joint as close as possible to the the image receptor. Central ray: Cephalic angle of 10 – 15 degrees caudad directed at the acromioclavicular joint. Purpose and Structures Shown: This view should demonstrate the lateral portion of the clavicle projected above the scapula. The middle portion is superimposed with the thorax. This view offers a chance of improved detail compared to AP since the part of interest is closer to the image receptor. Position of patient: The position of the patient should be upright (standing), facing the image receptor. Position the arms on the side of the body and adjust the shoulders so both lie in the same horizontal plane. Position of part: Center the clavicle on the image receptor. The central ray should be perpendicular to the image receptor and directed at the middle portion of the clavicle. The patient should be instructed to suspend respiration for the exposure. Central ray: Perpendicular directed at the clavicle.